A call to Fraser Yachts in Monaco brings confirmation of a €300,000 price drop on the 27m Leopard motor yacht Zamboanga, a central listing with Vassilis Fotilas. 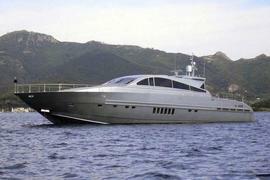 Zamboanga was built by Italy’s Arno yard in 2002 to a design by Paolo Caliari. Her distinctive silver Awlgrip paint makes this superyacht stand out in any marina and the interior and exterior are carefully planned to flow seamlessly into each other. Accommodation is for six guests in a master suite and a double and twin cabin while twin 2000hp MTU engines and Arneson surface drives give her a cruising speed of 30 knots. Available to view in Nice, Zamboanga is now asking €2 million.